Anybody owned a Zenith Chubby Scrubby B27 boar brush 28/55mm knot, I'm asking what is your reviews and thoughts about this boar brush? I'm told from there side of the story outside from P&C forum is by far better than the Semogue SOC, 2000 and Omega version. The shape of the knot's shape as well as the quality in sorting looks very promising. I might actually enjoy trying that as it is different than a Semogue 830. How much are they and where are they available? I haven't used it. I would be inclined to say be wary of the hype though. I know people announced Thater's entry into boars as the end all option, the second coming of Jesus, this is the new premium boar, and so much more. My usage with the a Thater boar hasn't quite been there. I'm inclined to believe this fits into flavor of the month territory. For that person it well may be that, but brushes are subjective, and what one may be absolutely thrilled about another might not have the same experience, i.e. my experience so far with Thater boar. 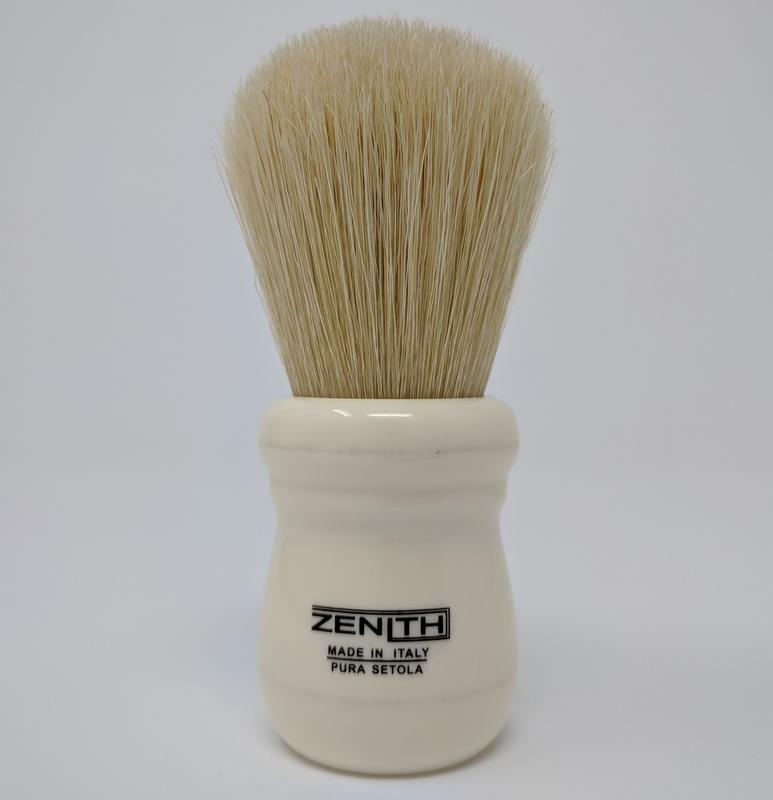 Saying that, this Zenith boar certainly looks like an excellent brush, and one that I've been tempted to pick up myself. I've had some Zenith badgers in the past, and they were of good quality. I'm with Zac that the quality looks quite promising. If you want a dense boar brush that is big this is your best option with the loft it is set at, the glue bump, and the size of the knot. Density wise it looks to be more than any other boar on the ready to buy market. I can state looking at the overhead profile of the knot it still isn't the densest boar out there. The B&B Custom Boar holds that distinction in my book. I have one and that is one dense brush. Even the SOC doesn't overtake it, and that's saying something as it is denser than average. Looking at it It has the appearance of a sort of an Omega and Semogue boar amalgamation, but with a Zenith element all to its own. 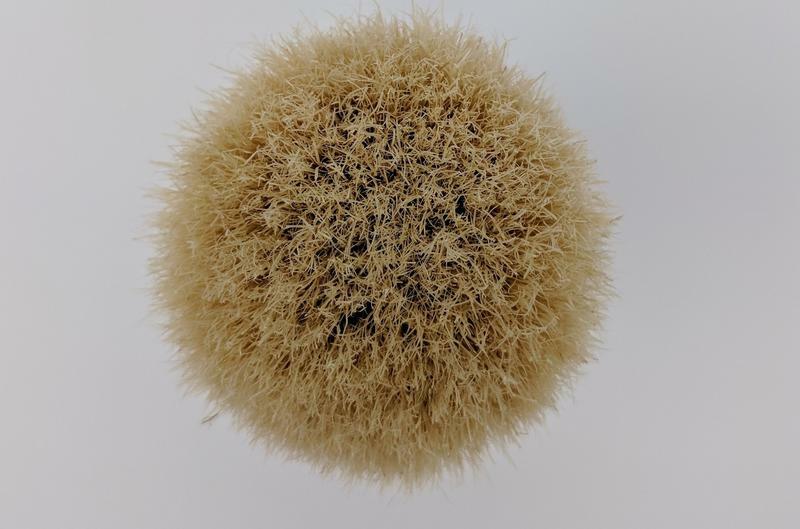 It has a look similar to the Omega Pro hair, but more yellowed in appearance like Semogues Premium 90% tops, and just a touch of refinement in the tips and some creamy white in the mixture that my Zenith boar has. It is the Pro 48 lookalike and it has very white boar hair, and quite fine tipped.